"Mary" - "Rabbuni" the most momentous exchange of greetings in Scripture. "Do not cling" but "go and tell" the most urgent requests in Scripture. "I go to ascend to my Father and your Father." the most significant message in Scripture. The bearer of this news was titled, "the Apostle to the Apostles" by the early Fathers. Who is this most significant person? The leader of the band of women, who followed Our Lord, and ministered to His various needs. Mary of Magdala is her name, one of the most faithful disciples of our Lord as recorded in the Gospels. Let us return to that spring garden on that very first Easter morn, just as the first streaks of pale pink light were illuminating the tomb where Jesus had been laid. Mary and the other women had come with their costly spices and ointments to anoint their dear Master, but alas, not finding Him, had reported this to the disciples who had come and gone. Mary alone stayed at the tomb. What thoughts must have entered her breaking heart! Who has taken Him? Where has He gone? Won't I ever be able to anoint His body in death? If only I could see my dear Lord again? What will I do without my Master, whom I love so ardently? Her reverie is broken by the angels guarding the tomb, who want to assure her, that her Lord has risen, but still she remains. "She carried on seeking him whom she had not found, weeping as she searched; and ablaze with love, she yearned for him in sheer intensity of love" (Gregory). Her overwhelming grief is disturbed by a voice- whose could it be so early in the day? Encouraging, thought Mary, as it must belong to one who knew this garden - of course the gardener himself! He will know, thought Mary, what has happened to my Lord. As she anticipates some news, with her question, "please tell me where you have put Him", her world is turned upside down, with that two syllable word, "Mary!" How often must she have heard those two syllables with all shades of expression over the last three years. But this time it is like the crashing of a wave on the shore, the sun rising above the mountains, the colours of a fully fledged rainbow arced across the heavens. Tears of grief give way to tears of joy, and doubts begin to dissipate. But then her Master rejects her outstretched arms - that next moment after hearing her name, Mary must have been the most difficult in all her life. She has just found the One she loves more than anyone else, the whole centre of her adoration, the One for whom she has been searching through her hot bitter tears - and to be rejected of her one desire - to embrace her Lord - that abyss of despair must have seen bottomless! But all is changed in a twinkling of an eye her Master has chosen her, whom he had once healed of some infirmity, to be His ambassador the first missionary the first to herald the Good News chosen to be the grain of mustard seed for the Christian faith. No wonder Mary Magdalen was held in special affection by the early Church Fathers who always referred to her as "the Apostle to the Apostles". That affection continued throughout the centuries, especially in Mediæval times when she became the patron saints of penitents as the church had falsely identified her with another woman in Luke's gospel (7. 37- 9). What do we especially learn from that first Easter morn? Firstly, perseverance and endurance. Despite the desertion of all others, Mary would not give up. First at the tomb, and the last to go, and not until she had achieved her goal. So we must learn "that at the heart of every good work is to be found the virtue of perseverance." (Gregory). The early Fathers always referred to this virtue as the Queen of all we surely need it to complete our pilgrimage to our heavenly home. Secondly, rejection. Mary did not run away as in a huff when our Lord refused her most ardent desire, but waited and listened for an explanation. How often do we run away when rejected or ignored or insulted. One of the hardest tasks of the Christian life is to turn the other cheek, and reach out in love. But we must do it if we are going to be faithful to our dear Lord and follow the Magdalen's example. Thirdly, comfort. The good works from Mary's perseverance was to greet her fellow disciples with the best news ever. We too have to be an ambassador of comfort to others despite what we may be enduring at that moment. Fourthly love. Mary showed it was love - an over brimming love a selfless love that made her stay in the Easter garden. Nothing would deter her. Mary showed that to love means to love even when a response or action from another is not what we would like or even welcome. Love is not just a feeling, it is a whole acceptance of another as he or she is. As already mentioned she was a popular saint in Mediæval times, and much devotion was directed towards her. One expression of this comes from the saintly St. Anselm, Benedictine monk and sometime archbishop of Canterbury in the 11thC. I am sure it also expresses how many of us still feel about this beautiful saint, even though we do not perceive her as a reformed prostitute. sins were forgiven; by him your bitter sorrow was consoled. medicine will restore the sick to health. forgiven, because she loved much. So blessed Mary Magdalene. pray for us all that we may always welcome Christ as our Rabboni. St. Mary Magdalen is celebrated on 22nd July. Those of them who knew her praised you, honoured you, and loved you in her, for they could feel your presence in her heart and her holy conversation gave rich proof of it. S. Monnica is celebrated on 28th August. I count all things but loss for the excellency of the knowledge of Christ Jesus my Lord. Phil: 3.8. Clare became the first woman to write a religious Rule for women, and despite all those who opposed her, including Popes of the time, she insisted that the Rule for her community be modelled on that of St. Francis, which emphasised the vow of poverty and living from alms. Her community at San. Damiano, on the outskirts of Assisi was the first of those that became known as the Poor Clares. Clare whose name means radiant 'one' was born in Assisi in 1194, into the wealthy ancient Roman Offreduccio family which owned a large palace in Assisi and a castle on the slope of Mt. Subasio. 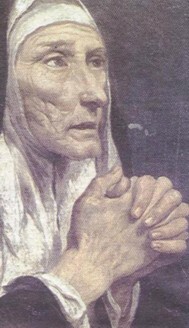 Virtually nothing is known of her life until she was 18 when she first heard St. Francis preaching in the church of San Giorgio during Lent of 1212. That changed her life. She sought out Francis and begged to be allowed to embrace the new manner of life he had founded. Francis advised her to leave her father's house secretly on the night following Palm Sunday. On Palm Sunday itself, Clare dressed in her usual finery to attend High Mass in the cathedral. When time came to receive a palm branch, she remained in her place as if glued there. The bishop instead came to Clare and placed the branch in her hand. That was the last time the world saw Clare in her finery, for that night with two companions she went to the Porziuncola, where the friars met her in procession, carrying lighted torches. Then Francis, having cut off her hair, clothed her in the Minorite habit and received her into a life of poverty, penance, and seclusion. Clare stayed provisionally with some Benedictine nuns at Bastia near Assisi, until Francis could provide a suitable retreat for her. When her father learnt where she was he tried to drag her home by force, but Clare held her ground. To give Clare the solitude she needed Francis transferred her to another Benedictine monastery at San Angelo in Panzo. Here St. Agnes, her sister, and other pious maidens joined her. Francis eventually established them at San Damiano's, in a dwelling adjoining the chapel, which he had rebuilt with his own hands, and which was now given to Francis by the Benedictines as domicile for his spiritual daughters. It thus became the first monastery of the Second Franciscan Order of Poor Ladies. Unlike Francis, Clare never worked outside the cloisters, and has thus been recognized as one of the great mediæval contemplatives. She had a special devotion to the Holy Eucharist and to the crucified Christ. For the latter she learnt by heart the Office of the Passion compiled by Francis. She remained devoted to Francis and between them there was a special tender relationship. On Francis' occasional visits to San Damiano, Clare entertained him with feminine attentiveness, such as having flowers on the table whilst they ate their scanty meal. 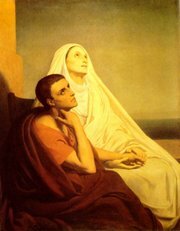 There are many beautiful legends about the mystical relationship between these two lovely saints. One reports that on a particular evening when they were together, St. Francis said, "It is time for us to part. You must be in the convent before nightfall. I shall go alone and follow at a distance as God guides me." Clare fell on her knees in the middle of the road, pulled herself together after a while, stood up and went on with bowed head without looking back. The road led through a wood. But she did not have the strength to go on, without comfort and hope, without a word of farewell from him. She waited. "Father," she said, "when shall we see each other again?" "When Summer returns, when the roses are in bloom," he replied. Then something wonderful happened. Suddenly it seemed to him as if a mass of roses sprang into bloom on the juniper bushes and thickly covered hedges. After the initial astonishment Clare hurried forward, plucked a bunch of roses and put it in St. Francis' hands. From that day onwards they were never separated. When Francis was blind and ill, she erected a little hut for him at San Damiano. It was here that he composed that glorious Canticle of the Sun, not long before his death. After St. Francis's death the procession which accompanied his remains from the Porziuncula to the town stopped outside San Damiano in order that Clare and her daughters might venerate their beloved whose body bore the stigmata of the crucified Christ. This moving scene was captured by Giotto in one of his loveliest frescoes in the basilica in Assisi, dedicated of course to St. Francis. However for Clare St. Francis was always living, and nothing is, perhaps, more striking in her life after his death than her unswerving loyalty to the ideals of Poverello, and the jealous care with which she clung to his rule and teaching for her community of nuns. She was also devoted to serving her community in manual labour with great joy, even during her many illnesses, and living out many of Francis' ideals, such as his love of nature. Much of her time was given in making altar linen for churches, and in prayer and penance in times of crises. For example, Assisi was in danger of attack twice by the Emperor Frederick II. Clare, although bed-ridden was carried to the wall with the Blessed Sacrament in the ciborium, and as she raised It the soldiers fell back and fled. Like the Franciscan friars, Clare's nuns soon spread to other parts of Europe, especially Spain where there were 47 convents by the end of the 13th century, Bohemia, France and England. She corresponded with her fellow sisters and five of these letters have survived revealing her care for them and encouragement to be faithful servants of Christ. One of her correspondents was Blessed Agnes of Prague, a cousin of Elizabeth of Hungary. This is an extract written to Agnes in 1253 shortly before Clare's death. "I rejoice and exult with you in the joy of the Spirit, O bride of Christ, because since you have totally abandoned the vanities of this world, like another most holy virgin, St. Agnes, you have been marvellously espoused to the spotless Lamb who takes away the sins of the world. Happy indeed is she to whom it is given to share this banquet, to cling with all her heart to him whose beauty all the heavenly hosts admire unceasingly, whose love inflames our love, whose contemplation is our refreshment, whose graciousness is our joy, whose gentleness fills us to overflowing, whose remembrance brings a gentle light, whose fragrance will revive the dead, whose glorious vision will be the happiness of all the citizens of the heavenly Jerusalem. 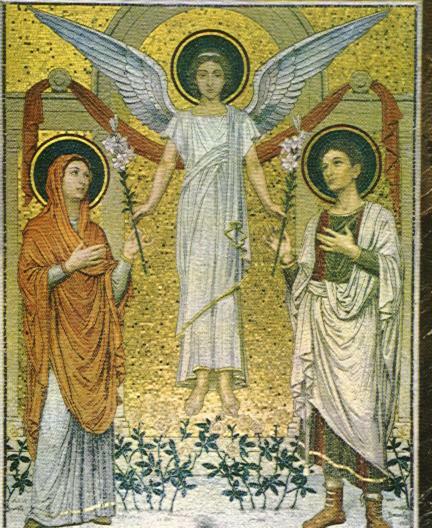 Inasmuch as this vision is the splendour of eternal glory, the brilliance of eternal light and the mirror without blemish, look upon that mirror each day, O queen and spouse of Jesus Christ; and continually study your face in it so that you may adorn yourself within and without with beautiful robes, and cover yourself with the flowers and garments of all the virtues as becomes the daughter and most chaste bride of the Most High King. Indeed, blessed poverty, holy humility, and ineffable charity are reflected in that mirror as, by the grace of God, you can contemplate them throughout the entire mirror. Look at the parameters of the mirror, that is the poverty of him who was placed in a manger and wrapped in swaddling clothes. O marvellous humility! O astonishing poverty! The King of the angels, the Lord of heaven and earth, is laid in a manger! Then, look at the surface of the mirror, dwell on the holy humility, the blessed poverty, the untold labours, and burdens which he endured for the redemption of the world. Then, in the depths of this same mirror, contemplate the ineffable charity which led him to suffer on the wood of the cross and to die thereon the most shameful kind of death. Therefore that mirror, suspended on the wood of the cross, urged those who passed by to reflect, saying, 'All you who pass by the way, look and see if there is any suffering!' let us answer his cry with one voice and spirit for he said, 'remembering this over and over leaves my soul downcast within me.' In this way, O queen of our heavenly King, let yourself be inflamed more strongly with the fervour of charity. And as you contemplate further his ineffable delights, his eternal riches and honours, and sigh for them in the great desire and love of your heart, may you cry out in the words of Solomon: 'Draw me after you! We will run in the fragrance of your perfumes, O heavenly spouse! I will run and not tire, until you bring me into the wine-cellar, until your left hand is under my head and your right hand will embrace me happily, and you kiss me with the happiest kiss of your mouth.'" When she died in 1253, three of Francis' early companions, Leo, Angelo and Juniper together with her sister, Agnes, were at her bed-side. She requested, as Francis had before his death, that they read aloud the Passion of our Lord according to St. John. Pope Innocent 1V was present for Clare's funeral procession. Two years after her death she was canonized by Alexander 1V. Without stain was God's image preserved in you, O holy mother Clare, for you took up your cross and followed our Lord in holy poverty. By word and deed you taught us to live in the spirit while still in the flesh. Intercede to Christ that he may save our souls! Amen. 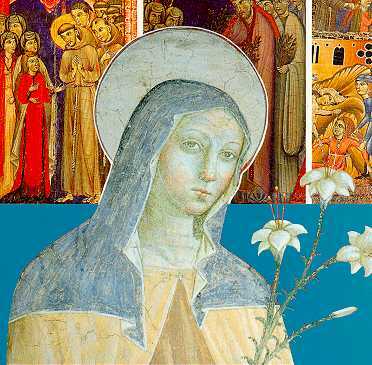 [St. Clare is commemorated on 11th August. ].